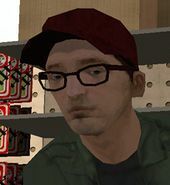 Zero is a character in the 3D Universe appearing in Grand Theft Auto San Andreas, 28 year old electronics expert and hobbyist who owns Zero RC in San Fierro. His business is in trouble and losing money, and this is due to his rival and arch-enemy Berkley, who owns a similar company. Zero and Berkley's rivalry began at a science fair, where Zero beat him, which led to Berkley swearing revenge on Zero. David Cross voiced Zero, and Zero's appearance was based on Cross. Zero is first introduced to Carl Johnson by his friend The Truth. Zero was sitting outside of his RC Shop in the mission where he is introduced, 'Wear Flowers In Your Hair'. He was introduced as an electronics expert, who could help Carl Johnson and his garage. Zero later phones Carl, to see if he can help with his business. Carl buys the shop, and then begins to help Zero in defeating Berkley, thus making Zero's shop the only one in town of it's type. This includes Carl shooting down remote control aeroplanes, destroying delivery vans and killing delivery boys, and finally defeating Berkley in a miniature war game. Winning the war game finally forces Berkley to leave San Fierro, allowing both Zero and Carl to make money from the shop. Zero later helps Carl and Cesar Vialpando steal cars for the Wang Cars business in Doherty, San Fierro. This includes putting a tracking device in a car, which Carl then follows and steals. Zero then lends his expertise to Carl Johnson and Wu Zi Mu as they plan to pull of a heist at Caligula's Palace in Las Venturas. This includes creating devices to stop the power from Sherman Dam, stealing four HPV-1000 police motorcycles and stealing a Leviathan. Zero also participates in the heist itself, instructing Carl Johnson, Wu Zi Mu and three others around Caligula's Palace. However, prior to the heist he had told Berkley, putting the whole heist at risk. Carl punches him at the Verdant Meadows airstrip. Zero also makes an appearance on Lonely Hearts, saying he doesn't want to be a virgin all his life. The host Christy MacIntyre says she cannot help him. This page was last modified on 12 May 2014, at 01:12.